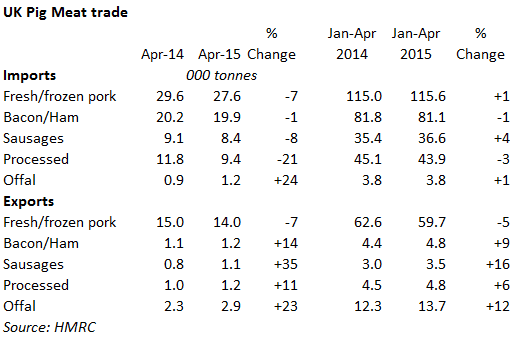 UK - UK pork imports and exports both decreased by 7 per cent in April 2015 compared with a year earlier. According to the latest data from HMRC, UK pork imports in April 2015 decreased 7 per cent on the level seen a year ago. The main falls were from Germany, the Netherlands, Belgium and France, while volumes from Denmark, the largest supplier of pork to the UK, Spain and Ireland actually increased. Volumes imported from Poland remain small relative to other countries but have been showing large increases for a number of months. These figures show that the preference for UK pork largely remains in place, following suggestions that the difference in prices was leading buyers to switch to European pork after imports in February and March increased. The total value of pork imports fell 16 per cent as average unit values saw sharp falls. Shipments of bacon to the UK were down 1 per cent in April, with larger falls from both Denmark and the Netherlands, while volumes from Germany and Ireland increased. Imports of processed pork fell 21 per cent due to lower shipments form Ireland and Poland, while sausage imports fell 8 per cent following a decline in volumes from Germany and the Netherlands. UK pork exports continued to fall in April, being down 7 per cent, as the continuing strength of the pound reduced the UK’s competitiveness against EU pork on international markets. Falls were seen in shipments to Germany, the Netherlands, Hong Kong and Belgium, while exports to Denmark, China and Ireland were higher than a year ago. Despite the fall in shipments to Germany, it remained the largest destination for UK exports in April. A decline in average unit prices led the total value of exports to fall 15 per cent year on year to £14.7 million. Offal shipments during the month were up nearly a quarter due to a large increase in volumes shipped to China, along with some recovery in exports to the rest of the EU.